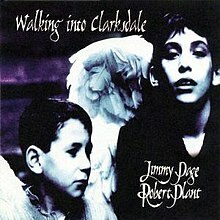 Walking into Clarksdale is the only studio album by Jimmy Page and Robert Plant, both formerly of English rock band Led Zeppelin. It was released by Atlantic Records on 21 April 1998. Walking into Clarksdale took 35 days to record. The album was recorded and mixed by Steve Albini over a five-month period at Abbey Road Studios. The single "Most High" was awarded a Grammy Award for Best Hard Rock Performance in 1999. Clarksdale is a town in the Mississippi Delta, a historical home of Delta blues music. The album debuted on the Billboard's Billboard 200 album chart at No. 8, while reaching No. 3 on the UK Album Chart. The single "Most High" reached No. 1 on Billboard's Mainstream Rock Tracks chart, and No. 26 in the UK. Plant re-recorded the song "Please Read the Letter" with Alison Krauss for their 2007 collaboration album Raising Sand. This re-recording won the Record of the Year award at the 2009 Grammy Awards. All songs by Jimmy Page, Robert Plant, Charlie Jones, and Michael Lee. "Most High" and "Shining in the Light" were released as singles, with a music video for the former. "Most High" was also featured as a CD single with the b-sides "Upon a Golden Horse" and "The Window". Lynton Naiff – string arrangements on "Upon a Golden Horse"
Ed Shearmur – programming and string pads on "Most High"
Tim Whelan – keyboards on "Most High"
^ Porcupine (2016). "Steve Albini talks about Page and Plant" (Video)|format= requires |url= (help). ^ MTV News Staff (8 February 2009). "Grammy 2009 Winners List". MTV. Retrieved 9 February 2009. ^ "CG: Jimmy Page and Robert Plant". Robert Christgau. Retrieved 27 June 2014. ^ "Top 200 Albums – 25 April 1998". lescharts.com. Retrieved 17 January 2009. ^ "Top 60 Albums – 1 May 1998". swedishcharts.com. Retrieved 17 January 2009. ^ "Top 100 Albums – 2 May 1998". chartstats.com. Archived from the original on 2 January 2013. Retrieved 17 January 2009. ^ "Top 40 Albums – 3 May 1998". finnishcharts.com. Retrieved 17 January 2009. ^ "Top 100 Albums – 3 May 1998". swisscharts.com. Retrieved 17 January 2009. ^ "Top 100 Albums – 4 May 1998". musicline.de. Archived from the original on 6 April 2012. Retrieved 19 January 2009. ^ "The Billboard 200 – 9 May 1998". Billboard. Archived from the original on 4 September 2014. Retrieved 17 January 2009. ^ "Top 100 Albums – 9 May 1998". ultratop.be. Retrieved 17 January 2009. ^ "Top 100 Albums – 9 May 1998". dutchcharts.nl. Retrieved 17 January 2009. ^ "Top 40 Albums – 10 May 1998". norwegiancharts.com. Retrieved 17 January 2009. ^ "Top 50 Albums – 10 May 1998". ARIA. Retrieved 17 January 2009. ^ "RPM Albums Chart – 11 May 1998". RPM. Archived from the original on 6 October 2012. Retrieved 17 January 2009. ^ "Top 40 Albums – 17 May 1998". MAHASZ. Archived from the original on 6 April 2012. Retrieved 19 January 2009. ^ "Top 50 Albums – 31 May 1998". RIANZ. Retrieved 17 January 2009. ^ "Top 75 Albums – 7 June 1998". austriancharts.at. Retrieved 17 January 2009. ^ "Top 100 Singles – 11 April 1998". chartstats.com. Archived from the original on 6 April 2012. Retrieved 19 January 2009. ^ "Mainstream Rock: May 09, 1998". Billboard. Retrieved 19 April 2013. ^ "RPM Singles Chart – 11 May 1998". collectionscanada.gc.ca. Archived from the original on 6 October 2012. Retrieved 19 January 2009. ^ "RPM Alternative Chart – 1 June 1998". collectionscanada.gc.ca. Archived from the original on 6 October 2012. Retrieved 19 January 2009. ^ "RIAA.org Walking into Clarksdale – 4 May 1998". RIAA. Archived from the original on 20 August 2010. Retrieved 1 January 2009.